Own the magic and the memory. Great as a personal collection or gift item. My Catbalogan Fine Prints are now available per order and on limited edition. All originals will be signed by the photographer as Proof of Authenticity. Original prints bear NelsonPetilla’s original signature in acrylic. All Artist’s Proofs remain with the photographer. Archival Pigment Ink on Archival Textured Fine Art Paper is guaranteed to last for years. Framing and matting are acid-free. Standard print size is 10×24 inches exclusive of matting on all sides, and 1×1.5-inch black standard box frame. 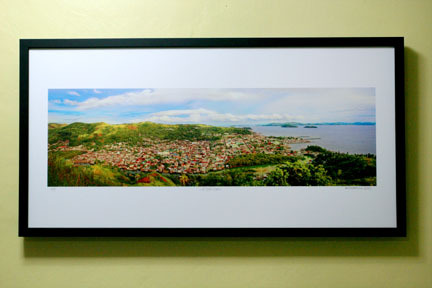 This panoramic photo captures the mood and natural and man-made landmarks of Catbalogan. The settlements are embraced by rolling hills and look over to a stunning view of Maqueda Bay to the west, the generous source of a medley of seafoods for Catbaloganons, and the site of spectacular sunsets that enthrall afternoon strollers by the seawall. The photo is available only on limited edition. * Only 20 prints from high-end digital master file available on a First Come First Served Basis. * A limited edition copy number, year photo was taken, name of artist photographer will also appear on the photo to identify the print as an authentic copy. Price: PhP 8,800 (US$ 180) excluding freight & handling outside Philippines.